Based on the latest science, this monumental program considers both uses and abuses of DNA. Stunning evidence compiled herein probes DNA as nature's bioacoustic and electromagnetic (that is, spiritual) energy receiver, signal transformer, and quantum sound and light transmitter. In other words, the bioenergetics of genetics precipitates life. These scientific revelations bring expanded spiritual meaning to life, physical embodiment, and even evolution. Yet leading genetic industrialists prefer to keep these uplifting and freeing truths secret. 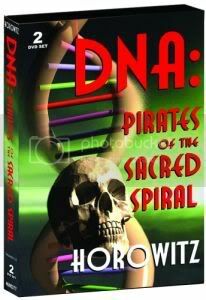 The infamous, untrustworthy Human Genome Pirates operate covertly, controlling genetic patents, spin-off technologies, and public information dissemination. With the world's most powerful banking and pharmaceutical cartel behind them, they now control civilization's destiny. Features revolutionary new views of emerging genetic research consistent with largely secret science and sacred spiritual knowledge. Includes the latest unpublicized research on electrogenetics, quantum physics, bioholography, and human consciousness. Stunning evidence compiled herein probes DNA as nature's bioacoustic and electromagnetic (that is, spiritual) energy receiver, signal transformer, and quantum sound and light transmitter.